These cookies, while they have all these interesting elements to them, are beautifully easy to make. Might I suggest that when it comes to making chocolate chip cookies, splurge on really good-quality chocolate to ensure deliciousness! Lately, I've been buying chocolate feves and coarsely chopping them up for chocolate chip cookies - the large pieces and different sizes create these delicious pools of chocolate that almost guarantees an amazing batch of cookies. I used Valrhona 66% dark chocolate feves here. Over Christmas, I treated myself to a Valrhona advent calendar and it really gave me a renewed appreciation for their chocolates. And when you're using high-quality chocolate, I don't think you need to go too crazy stuffing your chocolate chip cookies with it (though you certainly could). I used 1 cup, or 6 oz., of chocolate for half the original recipe, which I portioned into 15 cookies. It's significantly less chocolate than the original recipe but I thought it was a good amount. Whenever possible, I prefer to make chocolate chip cookies at least a day ahead and give it time to chill out in the refrigerator to maximum flavor. Chilling the dough also makes for a better shape. DisplacedHousewife has a good tip of freezing the dough balls for 10 minutes before baking - again, this helps the cookies hold its shape and not spread as much during baking. And of course, the best part of this project is baking up the cookies and tasting them! The cookies bake on the upper rack of a 375 degree oven for just about 11 minutes. They will be puffed and slightly browned but will still look soft and a bit underdone. Let them rest on the baking sheet for a few minutes as they continue to firm up and then remove them to a wire rack. You will end up with sturdy, firm cookies (I don't really love it when they fall apart in my hands) that are soft and wonderfully chewy! If you love a chewy texture to your chocolate chip cookies, you've got to give these a try! I think this recipe takes the best qualities of other already-good chocolate chip cookies and combine them to make quite a memorable one! 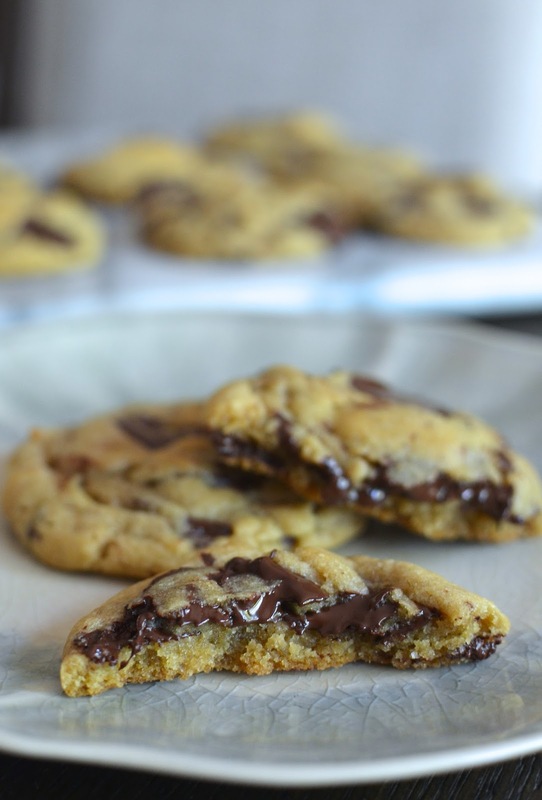 I am very happy to have this recipe in my chocolate chip cookie repertoire. P.S. - I'm writing this after dinner and I just had one of the cookies I baked up yesterday. Boy, they are so good...just as chewy and soft as they were fresh baked! Update: (January 2018) I recently made these cookies using 1 tablespoon olive oil and 3 tablespoons of canola oil (all else same) and they were delicious. Using mainly the neutral-flavored canola oil eliminated the fruity smell to the cookies (though taste-wise, the olive oil was not overpowering). My son was a huge fan of the revision! In the bowl of a stand mixer fitted with the paddle attachment, cream the brown sugar, butter, oil, and granulated sugar together on medium-speed until fully incorporated. Add egg and vanilla, mixing until blended, scraping down the sides and bottom of the bowl as needed. In a bowl, whisk together the flours, baking powder, baking soda, and salt. Add the dry ingredients into the wet ingredients and lightly stir together with a sturdy rubber spatula until barely blended (you still want to see streaks of flour in the mixture). Add the chocolate chunks and fold together until just combined. If time permits, cover the dough with plastic wrap and chill in the refrigerator overnight. When ready to bake, preheat oven to 375 degrees and set a rack in the upper third of the oven. Scoop about 2-tablespoon mounds of cookie dough onto a parchment or silicon-lined baking sheet, spaced about 2 inches apart. Bake cookies for about 11 minutes, when they are puffed and slightly browned but still look a bit underdone. Let cookies sit on the baking sheet for about 5 minutes to set, then remove to a wire rack to cool completely. They look indeed very GOOD and with just 1/4 cup sugar, they won't be too crazily sweet for my taste too. Hate to break it to you but there's 3/4 cup of dark brown sugar involved. Just can't make a choc chip cookie without it. Have a great weekend! Your chocolate sounds great - I'll have to look into it. And these cookies ... just wow! They do look like the perfect cookie. I have hearing about your trip - what a great adventure. Happy Mother's Day! This was the first time I used olive oil in chocolate chip cookies, too...have made olive oil cakes/muffins before. So interesting and got these cookies with awesome texture. Have a great Mother's Day!! After reading through your posts I find myself wanting to run out to the kitchen and make a batch of these cookies immediately. These sound like they have the perfect texture and flavor, also love the fact that this batch makes 16.....the perfect amount. Happy Mother's day to you! You are so sweet, Cheri! The texture really had me hooked! I halved the recipe and I actually got 15. We gobbled 9 up and I have 6 dough balls in the freezer that I'll bake up another day...the texture is amazing. Hope you try it. Have a wonderful weekend! 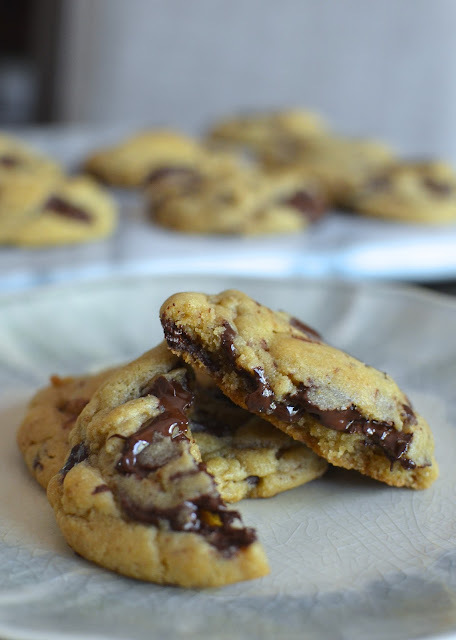 We just cannot stop staring at these dreamy chocolate chip cookies, made with olive oil. You are such a fantastic baker Monica! Wishing you a super Mother's Day! Thank you and a great Mother's Day to you!! Perpetually on the look out for the next "best" chocolate chip cookie, I am excited to give these a try! They have so much going for them! Our all time favorite has been the Jacque Torres cookie you mentioned. The different flours and letting the dough rest for 24-72 hours really does change the taste and texture. I have become a big fan of oil in baking for moist, long-lasting soft texture. This recipe does sound like the best of all worlds! (p.s. Valrhona chocolate is a great company. Not only is the chocolate delicious, but their dedication to ethical, sustainable sourcing is admirable! )Wishing a sweet, chocolaty, love-filled Mother's Day! Very glad to hear that about Valrhona...I will have go buy a lot more! : ) I agree, I also like using bread flour in baking (also the dark brown sugar here, Wendy!) and there are so many little quirks in this recipe that make them really good. The texture is just wonderful! Thank you for the Mother's Day wishes - same and more to you! Have a great one!! I adore the combination of olive oil and dark chocolate chips. Your biscuits look very "gourmand". I'm sure they tastes wonderful. Thank you so much! I had a very relaxing Mother's Day - such a treat. : ) These cookies are so different from the biscuits I've been making lately...it's great to enjoy both. I’ve never made a cookie olive oil before. when I posted my thomas Haas Cookies, a dairy free person asked me if she could make cookies without butter. Now I'll try and let you know. They look perfect and oh so soft! Oh, by the way, Happy Mother's Day! Thank you so much. Same to you - hope you were spoiled yesterday and had a great Mother's Day! Regarding these cookies - the texture really is memorable. The vegan cookies from Ovenly bakery that I tried previously (in the archives) were also good but it lacked flavor since it was all oil, not butter. These were much more flavorful and really great balance. I know - the craving for CCC is a constant thing that pops up! These have such incredible texture...loved them! Wow!! these cookies are very tempting. The best part is that you have made it in olive oil with less sugar. I am bookmarking this recipe and would be trying it out soon.